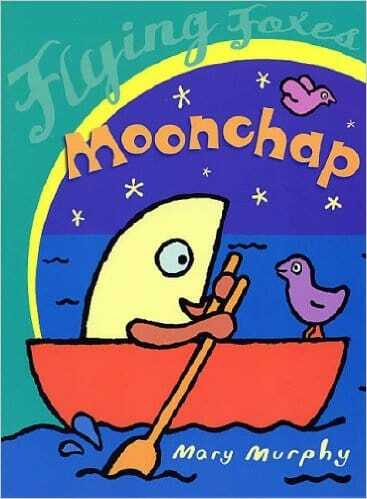 Mary Murphy’s (2003) ‘Moonchap’ is a story about a half-circled shape Moonchap, who sets out to explore a new territory where he and his friends could live on. Soon after, he arrives at at a land where Square and Circle live. The two neighbours fight a lot to the point where one day each of them is equally broken is half. In a rush to try to save them by putting them together, Moonchap ended up mistakenly joining each half of Square with each half of Circle, creating two new composite shapes who are much more friendly to each other. This story is perfect for introducing young readers to similarities and differences between 2D shapes, and a perfect story for older children to learn about composite shapes. (The latter can also provide a context for children to find areas and perimeters of composite shapes) Page illustrations are super cute and very colourful, and the ones showing individual 2D shapes and composite shapes are particularly useful to help children clearly see similarities and differences between 2D shapes and what composite shapes mean. All in all, ‘Moonchap’ is a perfect story for children aged 5+ years old to observe similarities and differences between 2D shapes, and a perfect story to introduce children aged 9+ years old to learn about composite shapes.